Hard to believe that it’s already October! For us Canadians, that means that Thanksgiving is right around the corner (like, next weekend – yikes! Better order my turkey!). I am really looking forward to Thanksgiving this year because we will host it in our home, and our little girl will enjoy it so much more than last year (when she was just a few months old). We have so much to be thankful for! When 1-800-Flowers.com approached me to use their flowers in an autumnal tablescape, I thought it would be the perfect trial run for our big dinner next weekend. And it just so happens that October coincides with the fall Year of Feasting event! The stars really aligned. Flowers for this post were provided gratis by 1-800-Flowers.com. All opinions remain my own. Thank you for supporting the brands that partner with Flourish & Knot. For more information, please see my policies. For those of you joining me here at Flourish & Knot for the first time: welcome! The Year of Feasting blog hop is one of my all-time favourite blogging events, where a group of Canadian bloggers each create seasonal tablescapes and set-ups, and then actually host the meal. This Thanksgiving one required a little bit of blogger magic (hard to host Thanksgiving ten days early! ), but my husband and I did in fact enjoy the food I photographed! We indulged in some Quebec cheeses, delicious charcuterie, fresh baguette, ripe local strawberries (soooo yummy! ), and a nice bottle of Riesling (our favourite white wine). We’ve had such gorgeous weather lately that I decided it would be lovely to eat outside once more. I set a vibrant table for us with vintage linens, navy-blue-and-white china (our wedding china), and bright orange accents. 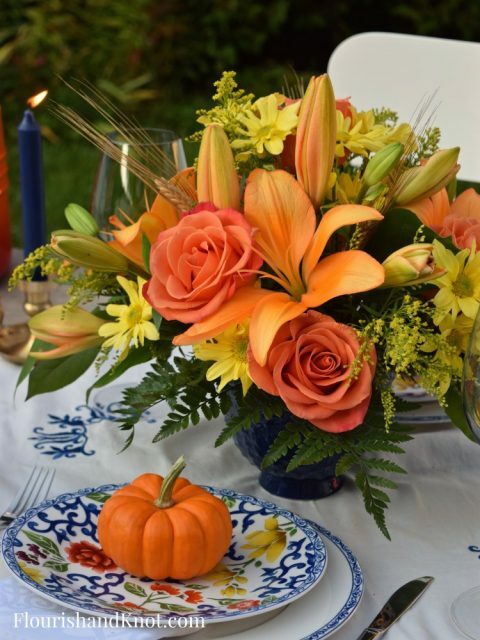 My favourite part of creating our tablescape was putting together a gorgeous, autumnal floral centrepiece, with flowers provided by 1-800-Flowers.com. I firmly believe that simple floral arranging is for everyone, if you just learn a few tips and tricks. Let me show you how to get the look I created. 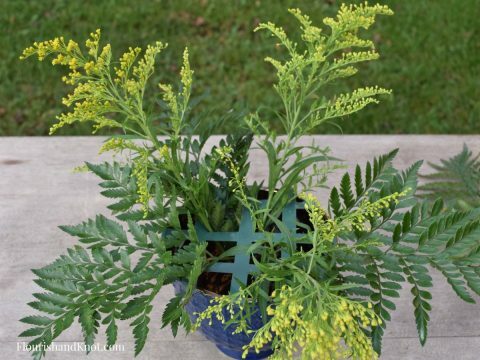 Begin by taking stock of the flowers and greenery you have to work with. Carefully deconstruct the bouquet and group things together. 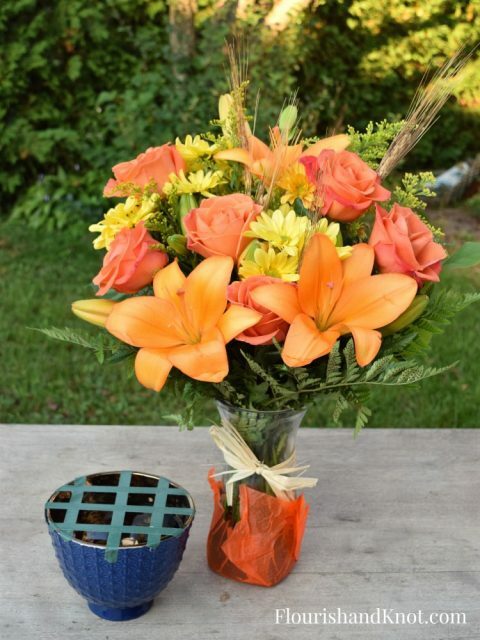 The bouquet provided to me by 1-800-Flowers.com was based on the Fields of Europe for Fall bouquet. The roses in particular were stunning, and the wheat stalks were absolutely perfect for an autumnal arrangement. They also add some unexpected spiky texture to the arrangement, which makes it much more interesting. I began my arrangement by creating a tape grid on my bowl compote, and filling it with clean water (to which I added some flower food). 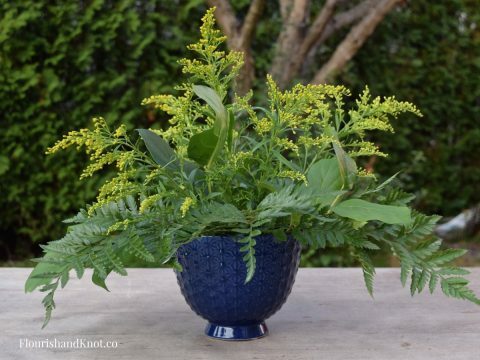 I then created my basic shape with the solidago and ferns. I worked in the directions of a compass, as I wanted the centrepiece to be beautiful viewed from every angle. The next step was to fill out the base of greenery with some salal and more ferns, and add three stems of mums. I kept those stems intact (rather than separating the individual flowers), to provide a cage-like framework for the rest of my flowers to sit in. I added my roses, spreading them out through the arrangement, and creating some visual lines with them (kind of like connect-the-dots in flowers!). 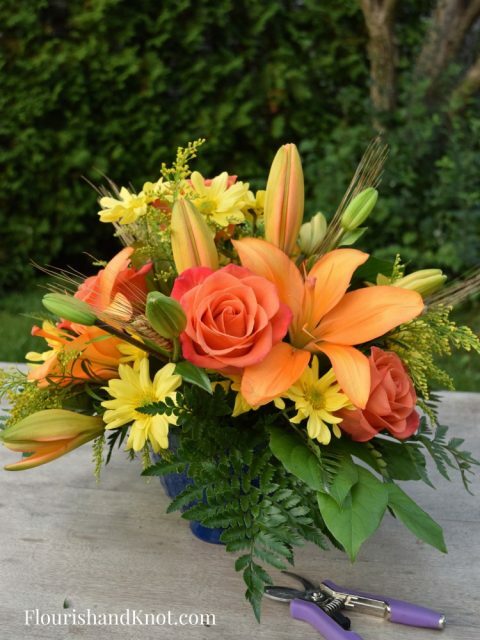 I then added the lilies, pulling off one or two petals that had been damaged during delivery. I simply re-placed a few roses to hide the missing petals. Such a great trick! I finished it off with a few more mums and the stalks of wheat. Say what you like about our collective mini pumpkin obsession, but I love them. So sweet and cute! Oh and I was so happy to discover four matching navy blue candles in my stash! I’ll be bringing those babies out again this weekend. I love how dramatic they look in the brass candlesticks. Thank you again to 1-800-Flowers.com for providing me with the flowers for this post. I really enjoyed creating my centrepiece with them, and would highly recommend the service they provide. The flowers were really beautiful, and the roses only just wilted (and I made that centrepiece 11 days ago!). I always get people asking me how to take a bouquet they’ve received and turn it into a more personalized arrangement. Well, this is just one possibility! I have plenty more ideas over on my floral arrangements page. There are seven other gorgeous Thanksgiving tables for you to check out in this edition of the Year of Feasting! Be sure to stop by and get some inspiration for this weekend (or November, for my American readers). 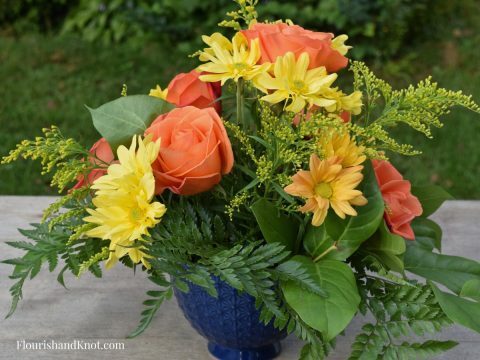 Your floral arrangement is absolutely stunning! And I appreciate the instructions because I am definitely not skilled at arranging flowers! The colours of the flowers are gorgeous and you have made them look so full and abundant! Your wedding china is so beautiful too! And doesn’t everyone have to put mini pumpkins on their table? 😉 Happy Thanksgiving! 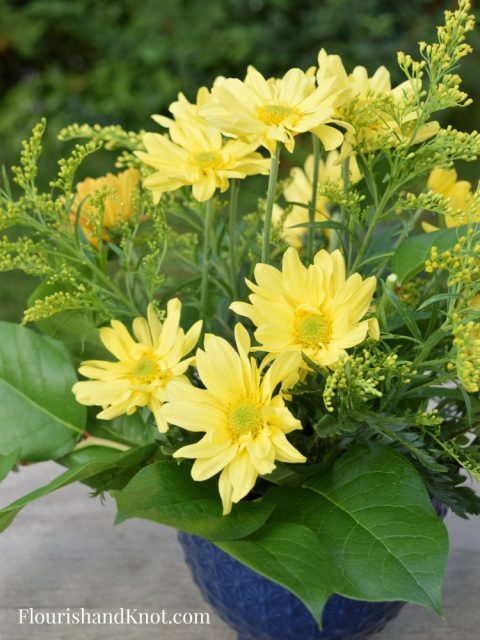 Flower arranging doesn’t have to be scary – I’m so glad you enjoyed my tutorial. Thank you for your kind words. 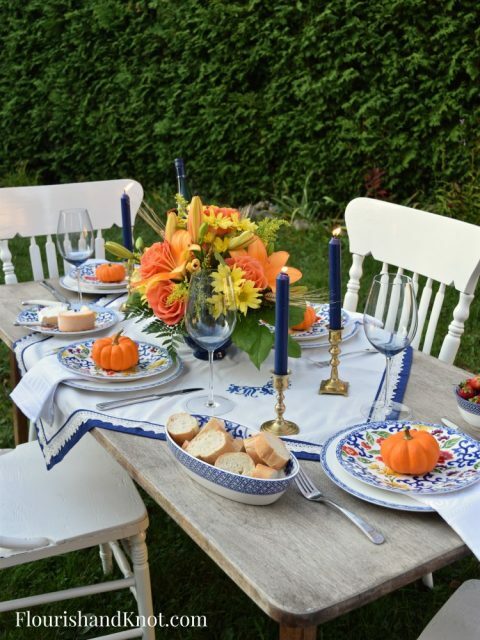 I love setting a fall table, so I had a lot of fun with this one. Beautiful bouquet and tablescape. Loving the contrasting colours that work so beautifully together. Yay for great weather to be able to dine al fresco! Happy Thanksgiving! I’m a big fan of navy blue with just about anything. Thanks for stopping by! Sarah your table looks great. It’s so pretty outside, and the flowers turned out great. Love the blue and orange combo too. Thanks for joining us and Happy Thanksgiving! Thanks, Dannyelle! I love doing this event – you’ve started a great series! Beautiful arrangement and lovely tablescape! 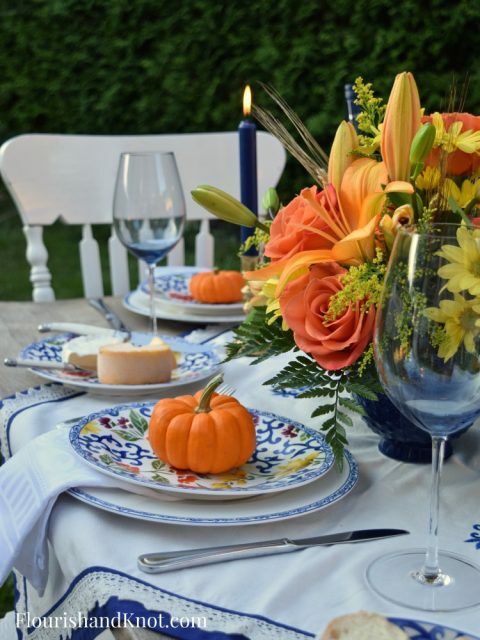 I love how you deconstructed the bouquet and showed us step by step, it looks gorgeous on your outdoor tablescape! Thank you, Laurie! I do love creating floral arrangement tutorials… Such pretty materials to work with! Very beautiful and they are the colors I love. Thank you for listing the flowers used and how to arrange them. You did a great job!!! Thanks, Marsha! Glad you enjoyed the post.